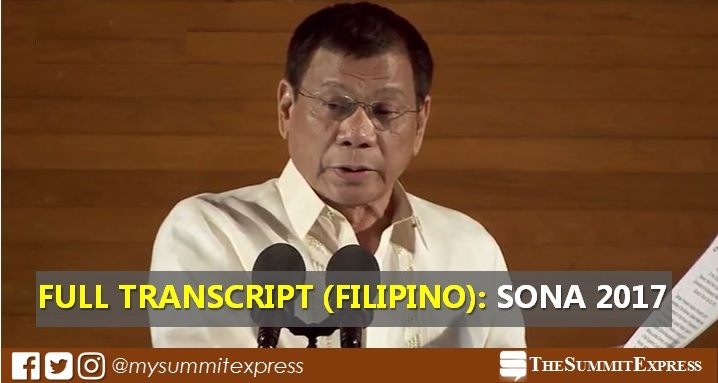 MANILA, Philippines - President Rodrigo Roa Duterte's second State of the Nation Address (SONA) full text or transcript is also available in Filipino language as delivered today, July 24, 2017 at the Batasang Pambansa Complex in Quezon City. Duterte's SONA speech, drafted in English, was delivered in approximately two hours due to pauses for applause and off-the-cuff remarks. Known as "President's Report to the People", the full text and transcript of the 2017 SONA will be posted immediately after he has spoken in front of 3,000 guests at the Plenary Hall. The traditional ceremony started at 3:30 p.m. (arrival) with President Duterte's speech delivery at 4:20 p.m.
"On the whole it will be frank, challenging, realistic but hopeful," Palace said on the content of Digong's speech a day before the SONA. Here is the full text of Duterte's speech, as provided by the Malacañang (Filipino or Tagalog version). The Presidential Communications Operations Office (PCOO) has also assigned sign language interpreter for those with auditory impairment. Spanish, French, German, Russian, Chinese, and Japanese interpreters will also be provided for the diplomats present during the event. An English translator is on standby to interpret the President's vernacular lines for attending foreign dignitaries.